Ultrasound is an example of biomimicry par excellence; even in a field rife with bio-inspired devices and medications, it stands out for its fidelity to nature. Consider that the three main components of an ultrasound device--a transducer to emit and capture the echoes of sound waves, a computer to process this data, and a screen to display the data real-time--are also utilized by organisms that rely on ultrasound for navigation. For instance, the sperm whale uses a highly developed transductive organ to emit sonar waves deep into the ocean in order to locate its prey. Bats famously use echolocation to capture insects after dusk. Each of these organisms uses 'transducer' organs to emit and capture waves, and their brains act as both 'computers' and 'screens' that allow them to see the world with a high level of accuracy when eyesight cannot do the job. Ultrasound devices in medicine today use the same technology to view the inner body real time, and they do such an effective job of this that a Harvard research team published a report in the New England Journal of Medicine in 2014 entitled Point-of-Care Ultrasound Imaging in Medical Education: Stop Listening and Look, which encourages physicians to supplement and possibly replace the stethoscope with diagnostic ultrasonography for physical examinations. The visual results of 3D/4D ultrasound technology have reached astonishing levels of detail, as a quick Google search shows. Most of the results display fetuses, but the clinical applications for ultrasound go far beyond fetal screening to include a wide range of diagnostic and even therapeutic uses as the chart on the right shows. 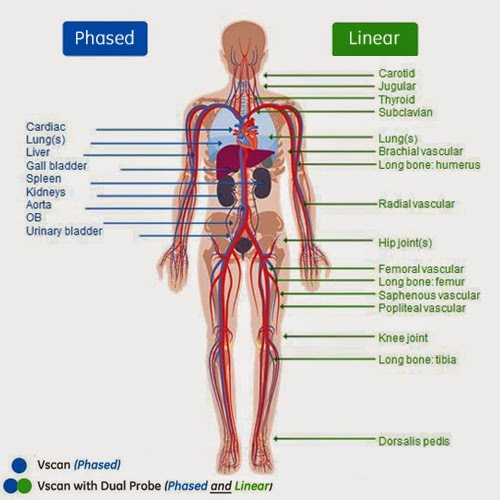 In fact, ultrasound as a medical imaging modality features several distinct advantages, including real-time viewing, speed and ease-of-use, no radiation exposure, and no pain. Ultrasound is also the least expensive internal imaging modality--the typical alternatives being X-ray, CT/PET scans, or MRIs--and does a particularly good job of displaying soft tissue. Ultrasound does have certain limitations. Air or gas disrupts the waves, as do bones, so ultrasounds are not a good method for viewing the bowels or bones beyond infancy. Especially corpulent patients attenuate the image quality due to too much soft tissue mass, and sometimes patients are covered with bandages or other materials that make ultrasound infeasible. Finally, the resolution of the images is not high enough for all medical imaging purposes. These limitations aside, there's a great deal of diagnostic and triage value that ultrasound provides across a continuum of conditions, as Dr. Janice Boughton describes in her article Real-life examples of ultrasound in the developing world on KevinMD. Lower-resourced clinical settings were early to foster Point-of-Care (PoC) ultrasound. In the United States, it seems that rural, county, and inner-city hospitals were early adopters of PoC in emergency and critical care situations. Dr. Resa Lewiss, in her excellent 2014 TEDMED talk, explains that in the early 1990s, there were fewer than five fellowships in emergency PoC ultrasound. In the early 2000s, her mentors and friends were using ultrasound for global health and disaster relief in countries such as Ethiopia, Kosovo, Sierra Leone, and Indonesia. Today there are over 90 emergency medicine ultrasound fellowships in the USA. Ultrasound continues gaining popularity as effective diagnostic and procedural tools. Emerging markets will continue to play an important role in fostering disruptive ultrasound products because of the relative ratio of patient need to paucity of clinical resources. In fact, the two best-known examples of handheld ultrasound in the world were created in India. 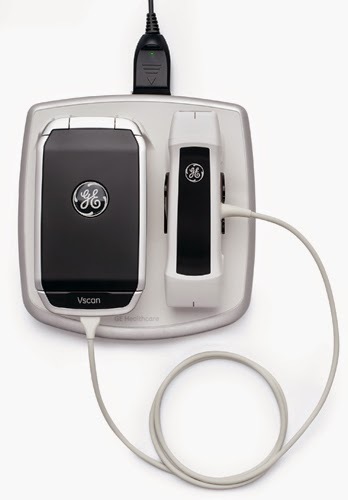 First, GE Healthcare India created the Vscan handheld ultrasound machine in 2009 as a means of providing affordable diagnostic data to physicians in India. 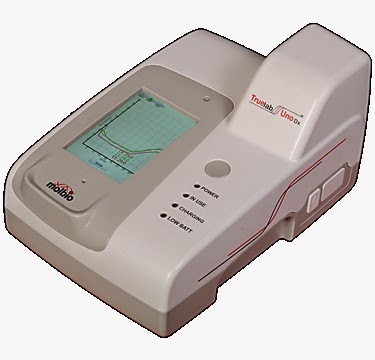 The Vscan is a picture perfect example of a disruptive innovation in that it performs less well on certain dimensions than incumbents, but it does a 'good enough' job in the vast majority of use cases, and it does this at a price of $7,900. This price is still high for India, but is more accessible than the $25,000 to several hundred thousand dollar price tags for incumbent models. Not to be outdone, Philips India developed the Visiq ultra-portable ultrasound device, releasing it in 2014 at a price of about $14,500. Visiq is a similarly compact setup to Vscan, but features a larger tablet-sized screen. There's currently a lack of indigenous innovations from India to compete with these technologies as low-cost handheld ultrasound devices, though Trivitron in Chennai has made a laptop-sized ultrasound screening device called Prosound 2. 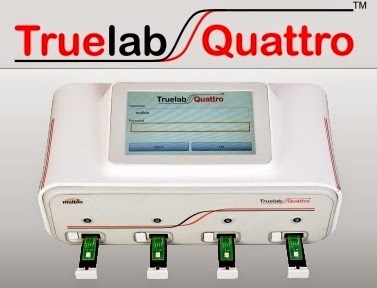 However, at a price of $20,000, Trivitron does not appear to be marketing the product to compete with Visiq and Vscan. In a certain sense, products only have disruptive potential, and Vscan and Visiq have disruptive potential in spades. Whether a product realizes its disruptive potential depends on whether management markets it disruptively. Will GE and Philips do this outside of emerging markets? Philips is not selling or marketing Visiq in the U.S., though it does have 510(k) approval from the FDA. GE Healthcare does sell Vscans in the U.S., but I have only read about their independent use by individual doctors, or about medical schools or teaching hospitals buying them in bulk for distribution to their students as a supplement to stethoscopes. In other words, neither GE nor Philips has marketed these products disruptively yet. This is not at all surprising: GE Healthcare would LOVE to upgrade their stethoscope market to using Vscans, but their sales people and finance department would protest mightily should the Vscan team aggressively disrupt their incumbent ultrasound imaging market in wealthy countries. GE and Philips hesitate to disrupt themselves, but what about grassroots innovators in the U.S.? Mobisante is a company in Redmond, Washington that received FDA approval in 2011 for a smartphone-enabled ultrasound device. Mobisante's MobiUS SP1 device (shown right), is priced similarly to GE's Vscan, retailing around $8,000. The company does not seem to have incurred much on the big device makers' core medical imaging turf, perhaps opting to gain a foothold first in medical education markets. Another niche market could come from supplying numerous non-medical providers of 'keepsake' fetal images, but this market may rapidly disappear: The FDA issued a warning in December, 2014 against the non-medical use of ultrasound devices in capturing fetal images or videos for keepsake purposes. Whether Mobisante can succeed in the core medical imaging market depends on many factors, but primarily on the quality of the product. 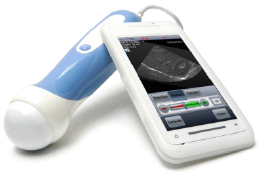 So, has the image quality of handheld ultrasound machines achieved parity with incumbent technologies? Dr. Eric Topol, on page 119 of his new book The Patient Will See You Now, cites a study he and colleagues conducted at Scripps showing that the image resolution from the Mobisante and Vscan devices were "as good as the standard, large ultrasound hospital machine that costs over $300,000 for performing heart imaging." With more than 125 million ultrasound studies performed in the U.S. per year according to WSJ's Laura Landro, and an average charge of $800 per study, Topol estimates that these handheld devices could save the U.S. $50 billion per year in ultrasound study costs alone if adoption of handheld ultrasound devices became routine in clinical care. And this estimate doesn't even count ultrasound's potential to disrupt the other imaging modalities, which account for an additional 450 million studies per year in the U.S.
Reenita Das, a partner with Frost & Sullivan, adds color to this in her recent Forbes article Could Plug-and-Play Be the Future of Healthcare Diagnostics?. She points out that software enhancement tools are improving ultrasound image quality to such a degree that the technology can now be used to identify and monitor cancer and other diseases. She points out that avoiding the need for painful biopsy and dangerous radiocontrast agents where possible will "significantly reduce the pain and cost of treatment for cancer patients." In view of this, ultrasound's potential to begin replacing other imaging modalities appears much larger. Its ability to do that while simultaneously lowering costs is what makes it so valuable. Has the image quality of handheld ultrasound devices achieved parity with the larger, more expensive machines? Can companies like Mobisante effectively target the core medical imaging market in the U.S.? Could handheld ultrasound devices really save the U.S. over $50 billion per year? The TTK Chitra Heart Valve is a model disruptive medtech innovation for India and the world. 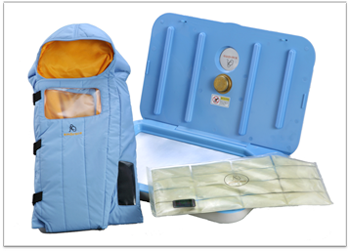 Developed painstakingly over 12 years at the Sree Chitra Tirunal Institute for Medical Sciences and Technology (SCTIMST) in Trivandrum, India, the device is now licensed for manufacture and marketing to TTK Healthcare in Chennai. It has nearly 90,000 implantations to date, and sold over 10,000 in FY 2011-12 alone. Additionally, TTK now exports the device to all neighboring countries, as well as South Africa. Overall, about 250 medical centers and 300 surgeons were using the TTK Chitra Heart Valve as of 2014. Importantly, the TTK Chitra Heart Valve is a Class III medical device, a status almost unique among indigenous Indian medtech. India still imports the majority of its medical devices across all classifications, but very nearly all Class III medical devices are still imported from abroad. The Chitra valve definitively shows that India has the technical capability to produce extremely high quality devices for even the most sensitive medical applications. The Chitra story begins with a glaring clinical and social need in India, where the incidence of Rheumatic Fever and Rheumatic Heart Disease (RHD) remains high among children. An estimated 2-2.5 million patients suffer from RHD in India, and this is the leading cause of structural heart valve damage in the country. This is an important difference between India and the U.S., where the leading cause of cardiac valvular stenosis or regurgitation (the two symptoms indicating structural damage and the need for replacement surgery) is Degenerative Heart Disease, a potential condition of old age. For decades, India relied on imports of expensive artificial valve replacements to meet domestic need, but many families whose children developed RHD were also among the poorest in India, and could not afford even the heavily discounted price tags of imported valves, which hovered around $1,200 each. And so their children died, or lived drastically shortened and unhealthy lives. The Chitra valve project sought to address this significant public health challenge by creating an affordable, high quality artificial heart valve for India. The project succeeded. Not only does it feature genuine design and material science innovations around in-vitro noise reduction, blood flow resistance reduction, and durability, but the valve also uses the highest quality materials and manufacturing for the frame, occluder, and sewing ring components. One would think such quality and a 12-year product development cycle with extensive clinical trials would raise the price considerably, but TTK Healthcare sells each valve for just $315-$400, a price range it has maintained since 1995, even in the face of considerable inflation in India. Facing such disruption from an indigenous entrant, the MNCs all lowered their prices for replacement valves to parity with Chitra's as a way to stay in the market. This cost reduction story is compelling, but there's an important caveat. The SCTIMST is a public institution, so the product development costs over 12 years were therefore likely funded by grants from the Biotechnology Industry Research Assistance Council of India and other public funds. Depending on the terms of investment and licensure to TTK, the Chitra valve's public genesis may have obviated the need to recoup any product development costs, potentially a major factor in its low price. From the perspective of the Indian public, the device may have fulfilled its purpose by crashing prices for most artificial heart valves. 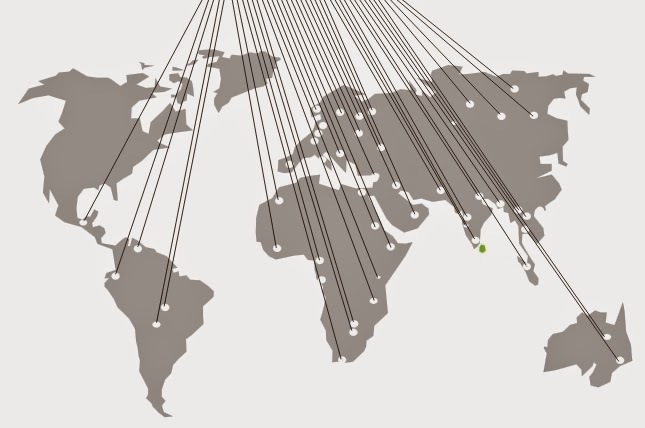 The fact that the Chitra valve continues to gain ground in India and around the world is a testament to its quality and adaptability. Could the TTK Chitra Heart Valve Succeed in the U.S.? The structural challenges facing the TTK Chitra Heart Valve in the U.S. are considerable. First, as a Class III medical device, price becomes less important relative to quality, and the bileaflet artificial valve models--though much more expensive--have marginally better performance in many use cases. Only serious cardiovascular surgery centers perform heart valve replacements, and these will likely opt for products that exhibit even marginal medical benefit over others, at least to protect themselves from unnecessary legal liabilities. Second, there are homegrown disruptive medtech innovations for certain operations in this space. 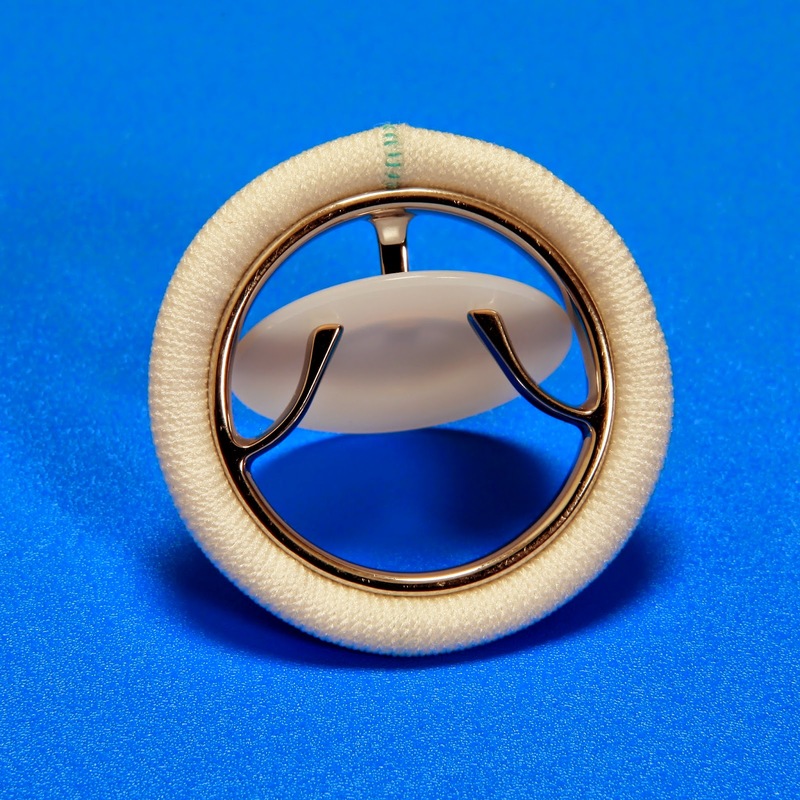 For example, the MitraClip is a device approved by the US FDA as a less invasive way to treat mitral regurgitation due to degenerative disease in patients with prohibitive risk for mitral valve surgery. This targets a substantial portion of the market for valve replacement as mitral valve regurgitation is the most common form of heart valve disease in the U.S., suggesting that there are even more Mitral Valve Replacement surgeries per year than the 20,000 or so Aortic Valve Replacement surgeries per year. Third, biological valve replacements are often preferred for placement is elderly patients, who form the bulk of patients requiring heart valve replacement surgeries in the U.S.. While biological valves are not as durable as artificial valves like Chitra, they don't require additional blood-thinning medicines, and are associated with a lower risk for blood clots. While the TTK Chitra Heart Valve's low price could be a major boon to certain U.S. patients shopping for low-cost heart valve replacement surgeries, these patients may need to content themselves with medical tourism for the time being. One good option may be Narayana Health's hospital in the Cayman Islands, which specifically targets medical tourists from the Americas. Is there demand for a low-cost heart valve like the TTK Chitra Heart Valve in the U.S.?